Cost – When it comes to cost, there is a great gulf between the two types. The manual version requires only a one-time investment that is significantly lower than the price point of its electric counterpart. The latter also has the added cost of replacing batteries and the head of the toothbrush. Time – The American Dental Association recommends that you brush your teeth at least two minutes per session. This isn’t necessary when using an electric toothbrush, though, because it produces 6,000 to 30,000 strokes per minute. Thus, when using this option, you can expect a much faster session than with a manual alternative. Control – The electric toothbrush is faster, but it can’t provide the control that you can get with the manual option. You can determine how fast you brush and the amount of pressure to apply, two things that are out of your control when using the electric alternative. Easy Use – Where it reduces control, the electric toothbrush makes up ground in the area of ease of use. If you have a condition or injury that limits your range of motion, the electric version offers the convenience of cleaning your teeth without you having to worry about maneuvering it about in your mouth. 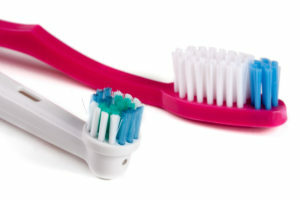 The final verdict is that the best form of toothbrush to use is the one that works best for you. Both will get the job done. Thus, the state of your oral hygiene depends more on your consistency and frequency. So when you address these components and the incorporation of flossing into your daily regimen, you are taking bold steps in the direction of excellent oral health. If you’re still unsure whether you’re getting the most out of your choice of toothbrush, just bring your concerns to the attention of your family dentist in Westmont at your next six-month appointment. While there, you’ll also be able to get feedback about your oral hygiene to see whether there are changes that need to be made based on the condition of your mouth, teeth and gums. So reach out today to schedule your first appointment. Dr. Kathy Lam delivers quality dental care in an environment that is comfortable and inviting. She serves patients of all ages by listening to their concerns and remaining steadfast in her dedication to meet their needs and bring smiles to their faces. She practices at Jason Hong DDS & Kathy Lam, DDS, PC and can be reached for more information through her website.